It may be entry-level, but don't think the a-25 is short on features. It has 12-megapixel resolution for crisp Images that bring the upcoming season's potential to life. A trigger speed of just.7 seconds means you're less likely to miss capturing an image of that Trophy Buck or other game. The new a-25 performs equally well day or night. 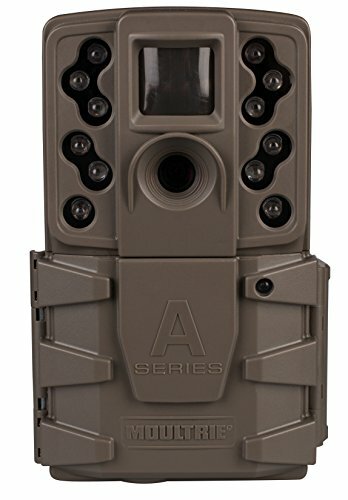 Our long-range Infrared flash reaches out to 60 feet, exactly matching the game camera's detection range. Powered by eight AA batteries, you can expect to get up to 17, 000 Images before changing batteries. The a-25 is also our lowest priced Moultrie mobile compatible camera. Easy-to-use interface and back-lit buttons make setup in low-light simple. And even though it's a Moultrie, and built to last, we still back it with our two-year warranty. With its outstanding affordability and value, the a-25 is an invaluable scouting tool because it puts the chance to operate multiple game cameras within reach of more hunters.